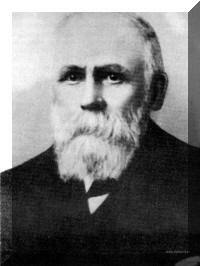 2-Thomas Walker, the seventh child of Michael and Sarah, was born on 8 Feb 1848 in Greenhills, Hagley, Tasmania, died on 2 Dec 1926 in Spring Rises, Exton at age 78, and was buried in Dec 1926 in General Cemetery, Westbury, Tasmania. 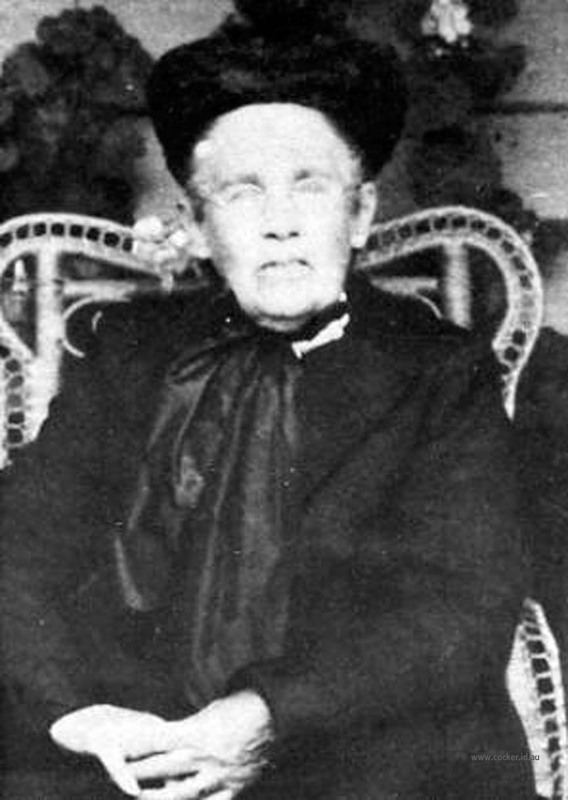 Thomas married Rebecca Badcock, daughter of John Badcock and Ann French, on 26 May 1869 in Westbury, Tasmania. Rebecca was born on 10 Aug 1848 in Clover Hill, Glenore, Tasmania, died on 24 Jul 1931 at age 82, and was buried in Jul 1931 in General Cemetery, Westbury, Tasmania. 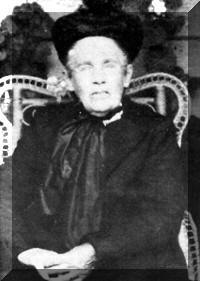 Thomas had the great good fortune to marry Rebecca Badcock, who was born at Clover Hill, Glenore in August 1848. They were both twenty-one years of age when married at Michael's home in May 1869. Rebecca was the daughter of John Badcock who had emigrated from Cornwall, England with the French family, marrying their eldest daughter and building Clover Hill at Glenore. Rebecca was a dressmaker, but found time to teach her younger children at home before they commenced school. She also attended to Thomas' business interests. In later years when Thomas' eyesight was failing it is said that she waited on him had and foot; her hands were never idle. "Her price was indeed far above Rubies!" Thomas and Rebecca reared 14 children, a remarkable feat in those days of high infant mortality. They were both forty-eight years of age when their youngest child, Laura was born. Thomas and Rebecca settled at Exton after their marriage, later moving to Spring Rises where Thomas farmed until his death in 1926. He became well known and highly respected in the district. He was active in church, farming and community affairs. They were both ardent workers in every cause for the benefit of the district. Thomas had attended Exton Methodist Church for over sixty-four years and it was mainly through his efforts that the new church was built. 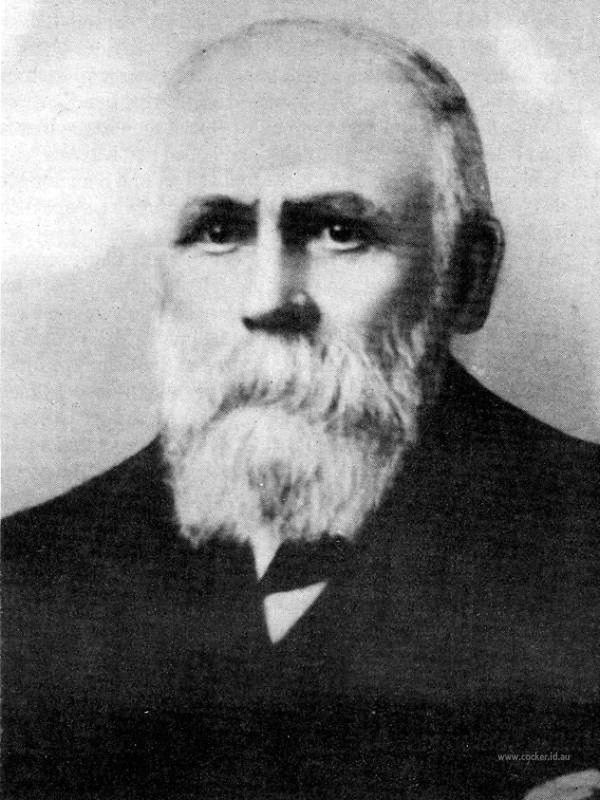 He spent 30 years as teacher and superintendent of the Sunday School (taking over from his father) and was ably assisted by his wife, who was greatly loved by her pupils. One of the reasons Thomas and his family continued to attend Exton Methodist Church was the presence of a toll gate at the railway crossing near Spring Rises; it would have cost quite an amount to take the large family to Westbury. Daughters Ida, Florrie and Rosalie commenced going to Westbury Methodist Church only after the death of their sister Laura. Apparently due to ill health and increasing deafness, Thomas and Rebecca had by then ceased to attend church. In public life, Thomas was a councillor for many years, where he was always attentive to his duties and his practical experience was a great benefit to the Westbury Council in many ways. He was for over thirty years a member of the Exton Road Trust.Thomas imported machinery from Great Britain and some was donated to the Launceston Agricultural Show Society and is displayed there with antique machinery. Thomas' machinery, threshing machines, chaff-cutters, etc., toured the district. One of these steam engines, beautifully restored is now owned by Max Chatwin of Sprent. It is said that Thomas charged more for this work than others, but was more reliable and responsible. Thomas' sons managed the machinery sideline until their marriage. They used to stand on a street corner in Westbury, and men would come from all directions to be chosen for work on the machines. Thomas was an innovator, one of the first people in the district to own a car and radio, and reputed to have accumulated one or more of almost any machine or agricultural implement that might be mentioned. His nephew Norman and great nephew Jack, in the course of droving throughout the lenght and breadth of northern, north-western and north-eastern Tasmania, saw many machinery parks at farms, but never one to surpass Uncle Thomas'. A single implement is recalled as not having been previously seen at "Spring Rises": one of the first shave ploughs, waiting for collection as Latrobe railway station. "He had to be first with everything", said the late Lay Badcock, himself one of Thomas and Rebecca's great nephews, while chaffing with Jack, re boyhood introductions to the memorabilia at "Spring Rises". Both recalled with amusement a first visit to the water closet, not through necessity, but to be allowed the pleasure and privilege of pulling the chain to "see how it worked". Similarly both recalled an invitation to sit and swivel in Uncle Thomas' office chair, etc. Lay also related following anecdote concerning Thomas. "After church service one Sunday he had all the young men cranking his T-Model Ford, and when they were all exhausted he turned the ignition on". Thomas appears to have been held in wholesome respect or fear by his workmen. One granddaughter when doing her training at the Launceston General Hospital met an ex-workman of Thomas' who said he had been sacked for swearing within a mile of the house. In the very early years of this century Thomas made a number of one day journeys to Launceston to attend the Agricultural and Pastoral Show. The local people thought that it was quite an adventure for him to travel to and from Launceston by train in a single day. Thomas and Rebecca were widely known for their generous hospitality which is well remembered to the present time. In this, they were happily assisted by their unmarried daughters. Folk have remarked that a highlight of their young lives was a day spent at Spring Rises. The Methodist Minister at Westbury was known to remark on busy washing days at the parsonage that he would go to Spring Rises for dinner as they always had "dumpling in the stew" on Mondays. Many had extended stays, one being Ernest Walker (nephew of Thomas) who stayed at Spring Rises for six months whilst studying for the ministry, later moving to New Zealand. Others were less salubrious guests, notably the tramp who was found ill at the gates by Tas on his return from Westbury with weekend Easter guests. The tramp was conveyed to the workman's hut by wheel barrow and nursed and fed. He is believed to have had pneumonia. On a return visit to Westbury, the Reverend Hambly, reminiscing of his young days spent at the parsonage with his parents, said that when the parsonage cow was dry another cow would come down from Spring Rises. Various members of the family, visiting Spring Rises during Thomas' later years, reminisced over his revolving chair, often the first encountered. He revolved it from facing the radio to facing the dining table. Another memory is of hearing the town clock in Melbourne strike noon on station 3LO, which apparently was the only station at that time.Thomas did not actively participate in the work of the farm after 50 years of age. Mr. and Mrs. Thomas Walker, of Spring Rises, Exton, celebrated their golden wedding last Thursday. The event was honoured by over 100 relatives and friends being present. The wedding breakfast was laid out in a large marquee, which was decorated with foliage, flowers and streamers. At the head hung the usual lucky bell, and on one side in silver figures was 1869 and on the other 1919. With the happy old couple were seated Mesdames H. Dobson and J. Harvey (sisters) Mesdames John Walker, Samuel Walker, John Badcock, William Badcock and R. Harris (sisters-in-law), Messrs S. Badcock and H. Dobson (brothers-in-law). Members of the family present were: Mesdames E. Masters, T. Clarke, A. Walker, F. Rootes, and Miss Ida, Florrie, Rosalea and Laura, Messrs Charles, Henry, Percy and Tasman Walker. One daughter Annie, who is on the mainland, was unable to be present owing to the shipping trouble, and a son Allan succumbed to an attack of fever when about 17 years old. There were also present 22 grandchildren. Reverend Churchward in proposing the health of Mr. and Mrs. Walker, referred in complimentary terms to the good work they had both done in connection with the Methodist Church and Sunday School at Exton. Mr. Walker had carried out the duties of superintendent of the Sunday School and Mrs. Walker had been a teacher for over forty years. During that period they had the full confidence of the teachers and the love and esteem of the scholars. It was mainly through Mr. Walker's efforts that the new church was built, of which he is trustee, as well as a circuit steward, at Westbury. The life of this happy couple was a most exemplary one and they were pleased to see their grandchildren following their footsteps. The Almighty had showered his richest blessings upon them and it was hoped that they would be spared to live many more years in happiness, peace and plenty. Councillor D. Burke expressed his delight at being present on such an auspicious occasion. He had been in close contact with both Mr. and Mrs. Walker for many years, and had always found them upright and honest in all their dealings. He had been associated with Mr. Walker for nearly 40 years on the old Exton Road Trust, and for about nine years in the Westbury Council where he was always attentive to his duty and his practical experience was of great benefit to the Council in many ways. Councillor Burke mentioned that he had celebrated his 92nd birthday and hoped that Mr. and Mrs. Walker would be spared to live to that age, and even longer. Mr. R. R. French endorsed all that the previous speakers had said, and expressed pleasure at being present on such an eventful occasion. Mr. S. Badcock thought all the sensible things had been said, and nothing left for him to touch on. However he referred to a few incidents of their young days, which caused some merriment and laughter. Mr. Walker on behalf of his wife and himself, desired to thank the Almighty for blessings he had bestowed on them which enabled them to live such a useful life. He had always endeavoured to carry out what the scriptures taught. "Do unto others that which you would have others do unto you", and with divine help he would continue to do so. Before taking his seat, Mr. Walker drew attention to some requirement necessary at the church at Exton and to commemorate the eventful occasion he had handed to Reverend Churchward a cheque for 60 pounds to have some necessary wants supplied. A cheque was also handed to the same gentleman to have some necessary work done at the church at Westbury. Reverend Churchward thanked Mr. Walker for his generous gifts, and assured him that the money was accepted in the spirit it was given. The presents were numerous and costly, including a beautiful illuminated address from the friends and well-wishers of Mr. and Mrs. Walker at Exton. In the evening, although the weather was bad, about 80 young folk assembled to further carry out the celebrations. Thomas and Rebecca's family appeared fairly robust, but two, Allen and Laura, died in early adulthood. Illnesses affecting the family appeared to be chiefly pneumonia and bronchial asthma. 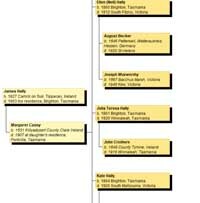 Six of the family lived to be over 80 years and one over 90 years. Thomas liked his wife to have the best, and once when Rebecca was departing for Launceston to shop he told her to get a good coat. She bought a Persian Lamb coat. Rebecca used to drive around in a Phaeton in earliest days, visiting the sick and those who were bereaved during the First World War. As she was leaving and bending down to kiss the babies, the mothers used to put their faces up for a kiss too. Thomas apparently suffered from bronchitis for some years before his death, but remained alert, transacting business on the day he died. He died on 2nd December, 1926 at Spring Rises in his seventy-ninth year, having had a trained nurse in attendance for several months before his death. Rebecca moved to Westbury with her three unmarried daughters and lived at Roselawn, the house her son Harry had built for his retirement. Rebecca died on the 24th of July, 1931, being almost 84 years of age. In view of Thomas Walker's long and worthy association with Exton Methodist Church, it has been deemed appropriate to place a brief history of that church immediately after the section dealing with the lives of Thomas and his wife Rebecca. A history of the Walker family would not be complete without mention of the Exton Methodist Church, around which, as in many other pioneering families, their lives revolved. Michael and Sarah came to this land with faith, and with values, living responsibility and bequeathing lasting values to the generations to come. Michael was largely responsible for building the Exton Methodist Church, the following is an extract from his diary. I came to Exton in 1856, there was no church, Exton being almost a wilderness, and very few church going people. Brother Purton (now of Victoria) and myself got a few children together and commenced a Sunday School, and held Cottage Prayer Meetings. About 12 months later Reverend Lelean arrived at Westbury and it was decided to build a church at Exton. The church was duly opened with the Rev. Lelean conducting the service. The day was very warm and many could not gain admittance. The congregation improved and in 1888 a new church was built and opened by the Reverend Cox of Devonport. The Jubilee of the present church was held in September 1935 when the Reverend R. E. Hooper of Launceston was guest preacher. On the Monday people from many parts attended a tea meeting. A cricket match between local preachers and trustees was won by the former after a close and exciting game. An evening programme was provided by a concert party from Launceston. In 1955 the centenary of the Exton Methodist Church was celebrated, many ex-members of the church visiting for the occasion, over 300 attending the services and luncheon. The service was conducted by the Reverend T. P. H. Woodford, who had been in charge of the Westbury circuit 30 years previously. The Westbury circuit had many outstanding ministers over the years, two of these being the Reverend Lechte and the Reverend L. Turner becoming president of the Methodist conference of Victoria and Tasmania. The Exton Church was fortunate over the years in having a choir and trained singers, willingly giving of their time and expertise. The name Methodist was changed to Uniting in 1977. Owing to a dwindling congregation it was reluctantly decided to close the church in July 1982. It was sold and became a private residence.